My work for Prohibition Bar in New York was a great reminder how fun it can be to do quick, one off projects. Sometimes those present the most challenge, since they often demand a clever solution at the drop of a hat. I really enjoyed working within their aesthetic: a nice blend of upscale minimalism with a flair for retro kitsch. One of the more make-it-work asks came in the form of a table card that would inform customers of the mandatory two drink minimum. My business side obviously understood the value in reminding customers not to camp out at tables for hours nursing a single beverage, especially if it were a Friday or Saturday night. 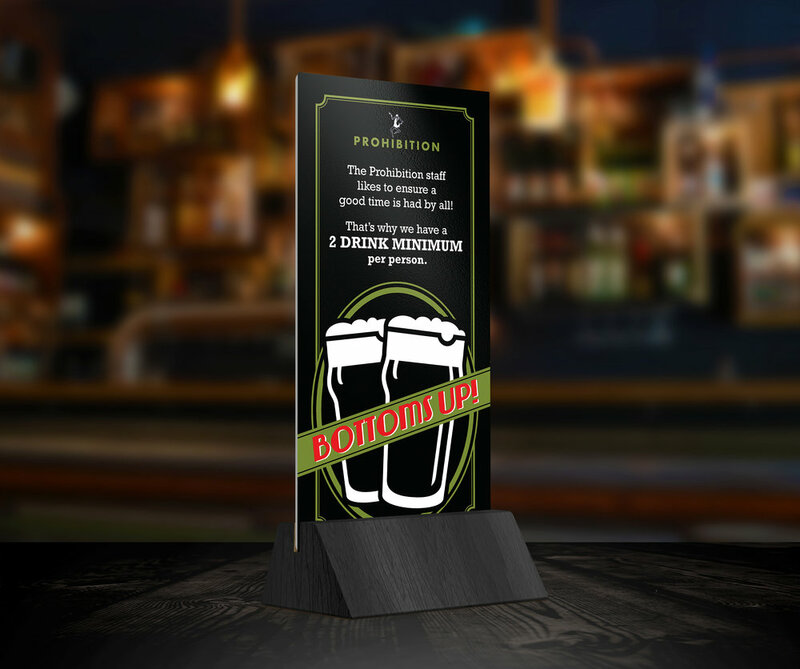 However, the customer in me immediately thought, ‘don’t tell me what to do, I was going to order three but now I don’t want any… ‘ Knowing that your average person on a night out is more prepared to give orders and not take them, I devised a solution. I wrote up some copy expressing that the two-drink minimum was actually in the customers’ best interests, that Prohibition only wanted to make sure they had fun. My idea was to meet the customer half way and hope that, through humor, they would reciprocate. Prohibition loved the idea and put the cards into use.